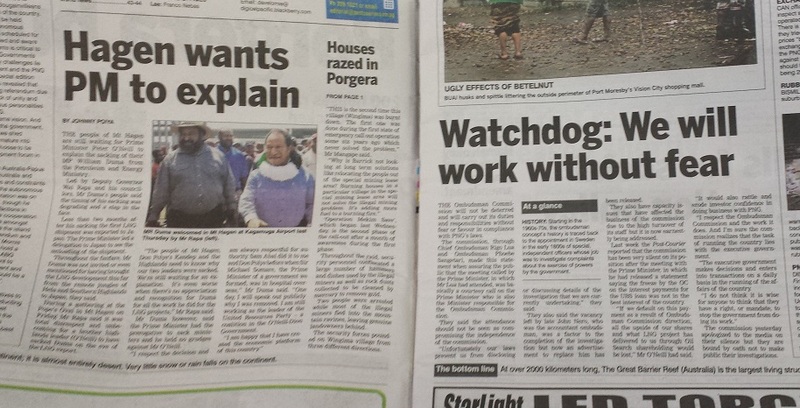 It is said that a week is a long time in politics and that has never been more true than in PNG politics this week. This week, the Prime Minister was arrested on corruption charges, but apparently hid out in Parliament House (where he cannot be arrested) until a stay was obtained, preventing the arrest. There have been calls for the PM to resign, but he is refusing. Meanwhile, the head of the police and others who have been trying to have the PM arrested have been sacked. Today, there is a call for a general strike and a march on Parliament House. The new police chief has overturned a decision to allow the protest march. It will be interesting to see what the outcome of all this is. PNG politics is difficult to follow at the best of times, but particularly at the moment when it seems to shift substantially in the space of an hour. Allegations of sorcery continue to result in horrific violence throughout the country. In this case, some women narrowly avoided a violent death when some soldiers heard that they were being attacked and came to the rescue. Most of this country waits patiently for the renaissance. In the meantime, they continue to live in the Dark Ages. Tempers flare when people feel that their rights are being encroached upon. 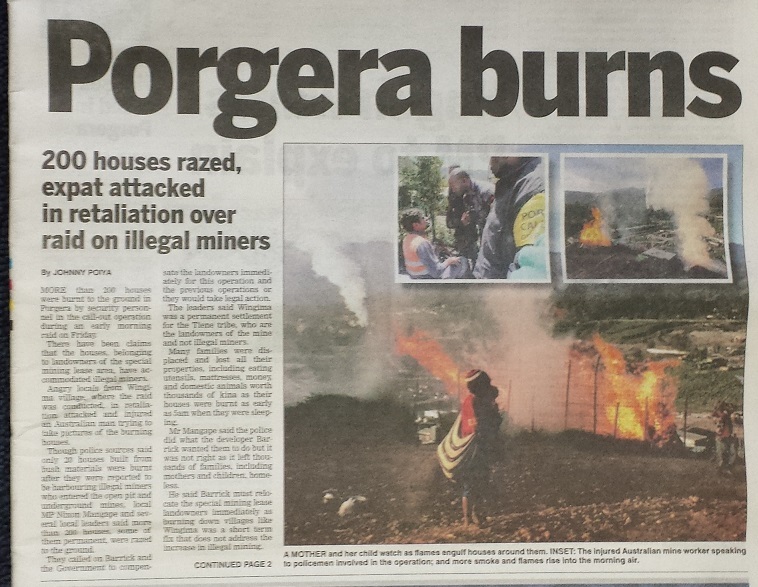 In Porgera recently, people were attacked and 200 homes burned to the ground in a dispute over illegal mining. I drove past a car accident on Waigani drive last week and only found out afterwards that it was the talk of the town. Some criminals stole a mini-bus from a local accounting firm, used it in a robbery and then attempted a getaway in the mini-van. They didn’t get far – crashing directly into another vehicle, allowing the police to catch up with them. The article refers to six injuries but in reality two were shot dead by the police in the street. 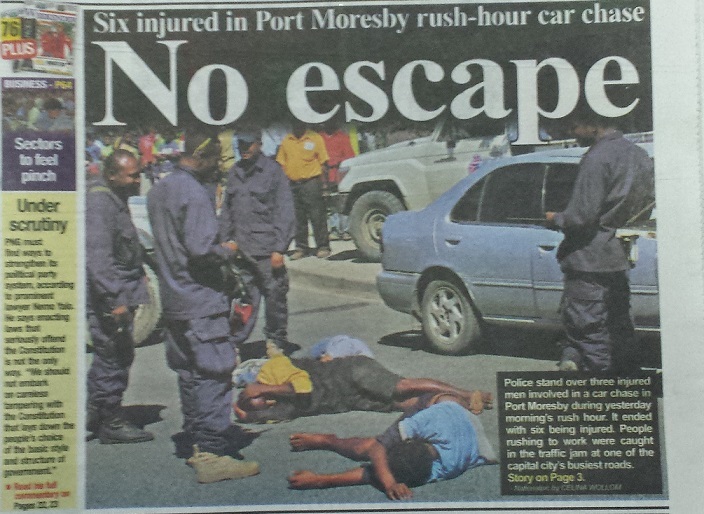 Crime mostly pays in PNG, but just occasionally it doesn’t. If you want the truth, speak to drunk people or children. 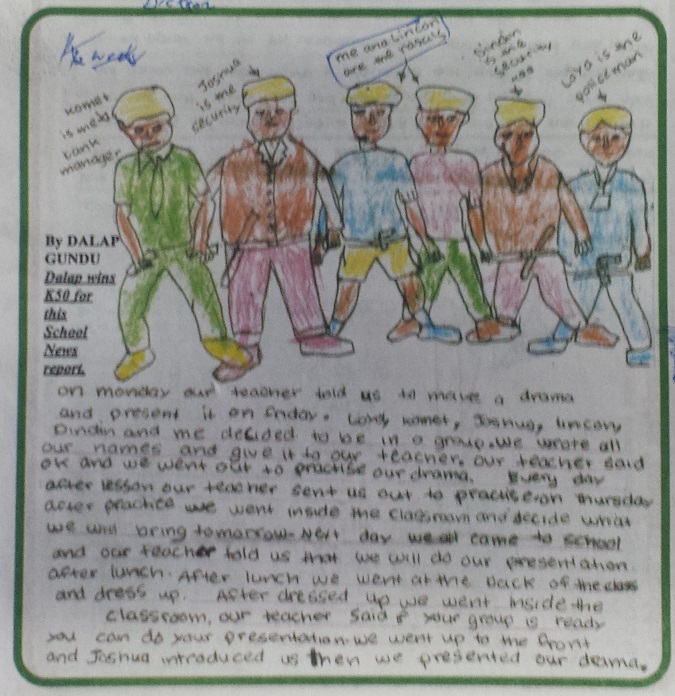 In this case, a child’s drawing that was published in the paper reveals much about the realities of life in PNG. The child describes how he and his friends created a play for school in which they gave themselves roles such as “rascals” (criminals), “Security Guards”, and “Police”. 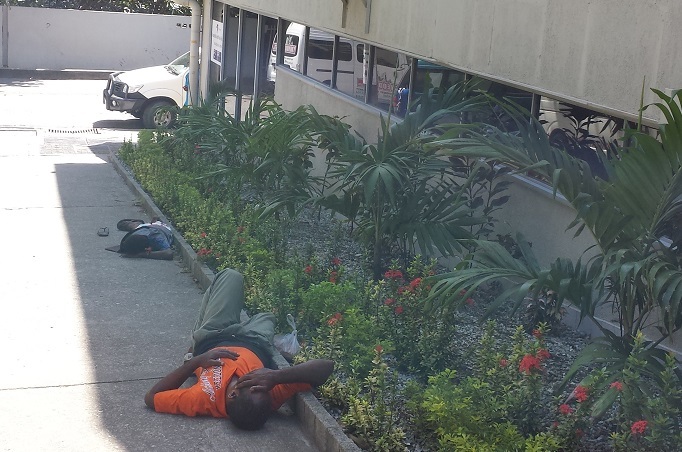 PNG does not have a large homeless problem, however from time to time one sees people who seem to have nowhere else to go. I passed these two chaps were enjoying a little shade in the middle of the day. In happier news, nothing gets in the way of young love and in this case, the family of a Jiwaka man all chipped in to buy him the bride of his dreams. She was expensive – 47,000 kina in cash (about US$18,000), a bunch of food and 47 pigs. All the best marriages tend to start with an exchange of livestock. I’m sure he’ll be satisfied with his purchase. 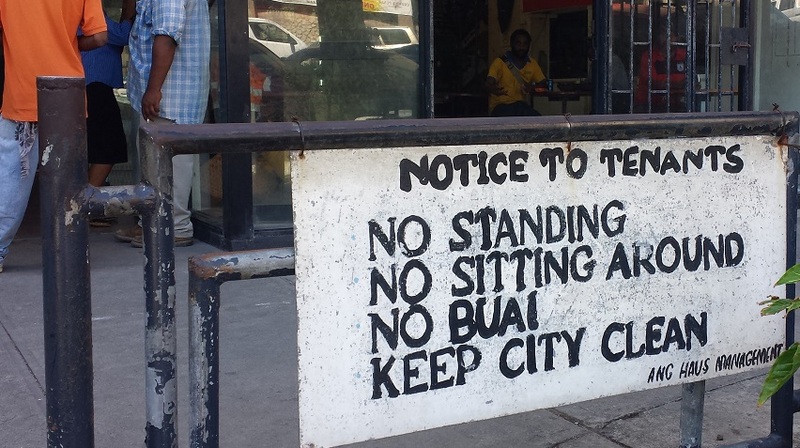 I enjoyed this sign outside a building in Town – especially the second option – “No sitting around”. 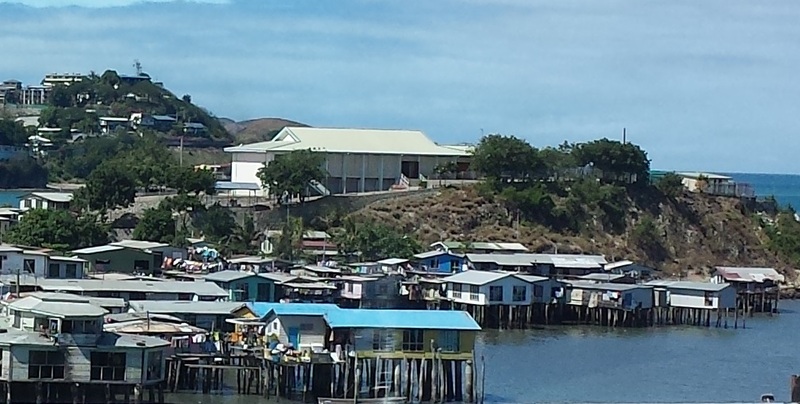 The port of Port Moresby provides a constant source of entertainment. A big stir was caused in town last week when the ship “The World” arrived. I had just assumed that they were lost and ended up here, but no, apparently they came here deliberately. The World is not a cruise ship. It is the world’s largest privately owned yacht. It contains 165 luxury residences and spends its time touring the globe. I heard that the residents complained about the quality of their tour guides in PNG, saying that they couldn’t understand a word they said. That doesn’t surprise me – pronunciation here varies enormously but a good portion of the population speak English with such a thick accent as to render them incomprehensible. The Rugby League State of Origin series is on again. Last Wednesday was the second game, so I wore my New South Wales Blues flag as a cape to the office (like I did last year). Out of protest, some staff erected a “Maroons Zone” sign and forbade me to enter it. I had the last laugh though – the Blues won 6-4, winning the series for the first time in 9 years. I watched the game at a local club on the big screen. The atmosphere was colourful indeed and there were many people celebrating with me when NSW scored the winning try. Here’s something I’ve never seen before. In a clothing store in Port Moresby, they have a sign up saying that white garments cannot be tried on. I enquired about it and the answer from staff was that they are worried that the clothes will get dirty. It’s intriguing because, while there is no question that personal hygiene standards here are far below what I am accustomed to in Canada, it is a bit odd for a store to send the message, “We don’t trust you enough not to make our clothes filthy”. I guess if one wants to buy white in PNG, one rolls the dice and just hopes that one bought the right size. However, there are always fun and social occasions to be had in Port Moresby as well. 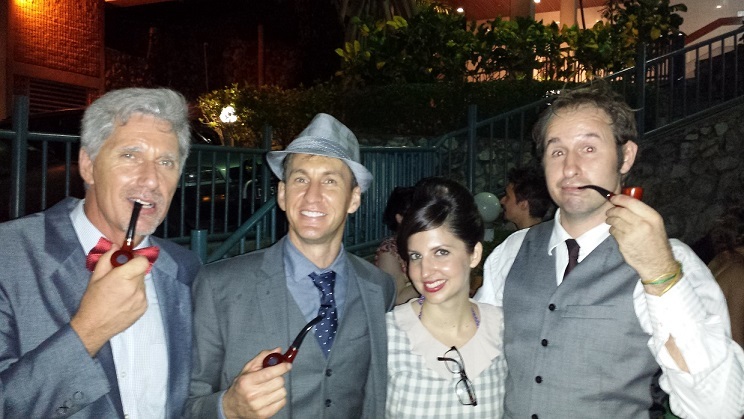 At a recent party, we all dressed up like “Mad Men”, complete with pipes. 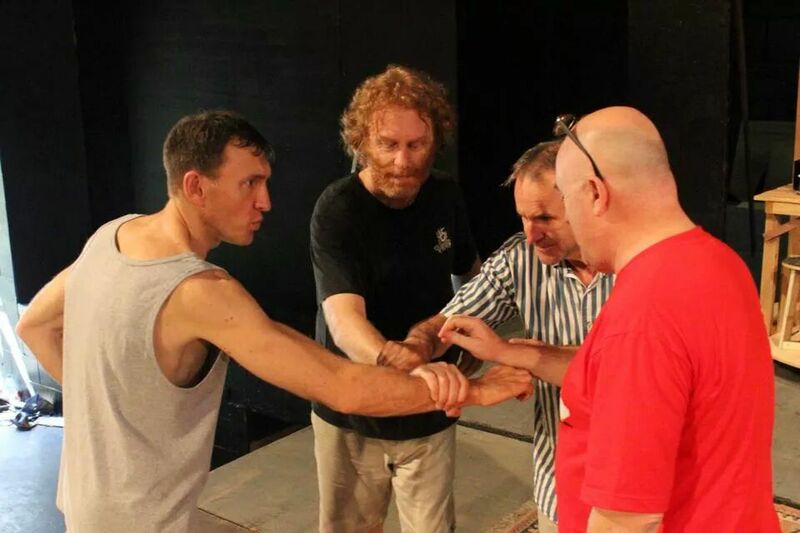 And being involved in a theatre production is another example. 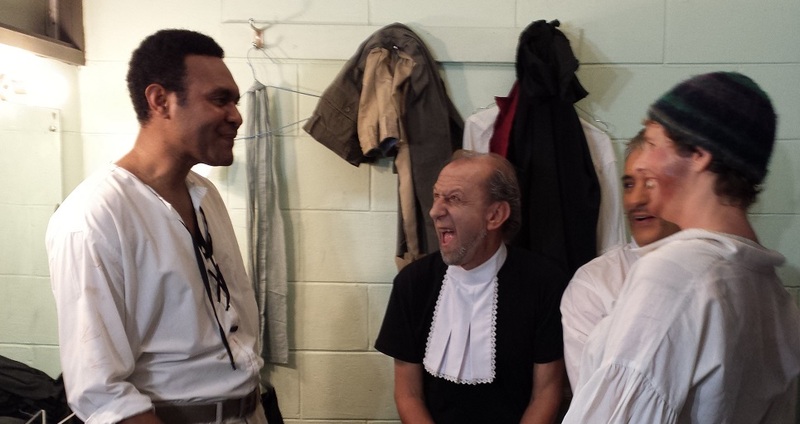 Putting on a Shakespeare production is a monumental challenge at the best of times. It is even more challenging to attempt it in Papua New Guinea. 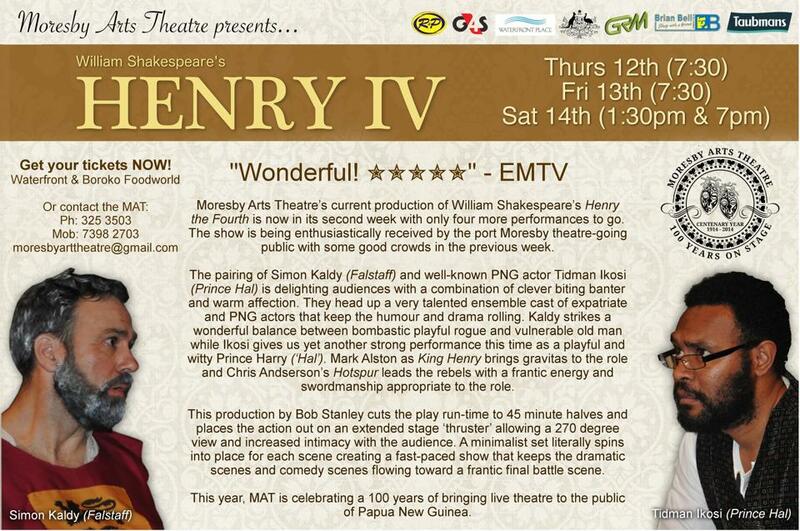 But that is precisely what the Moresby Arts Theatre has just done, and I am proud to have been a part of it. 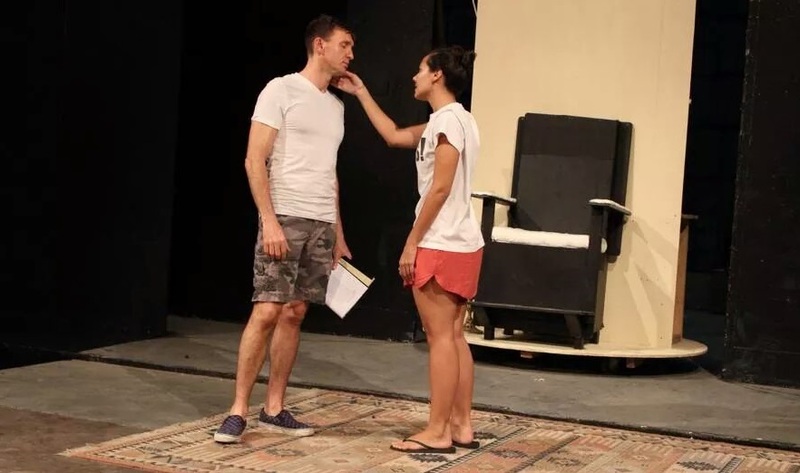 The Moresby Arts Theatre (MAT) has been putting on plays in Port Moresby for 100 years, and has been in the current building for over 40 years. It is amazing to me to think that 100 years ago, in 1914, there were expatriates just like me putting on productions here to entertain the masses. 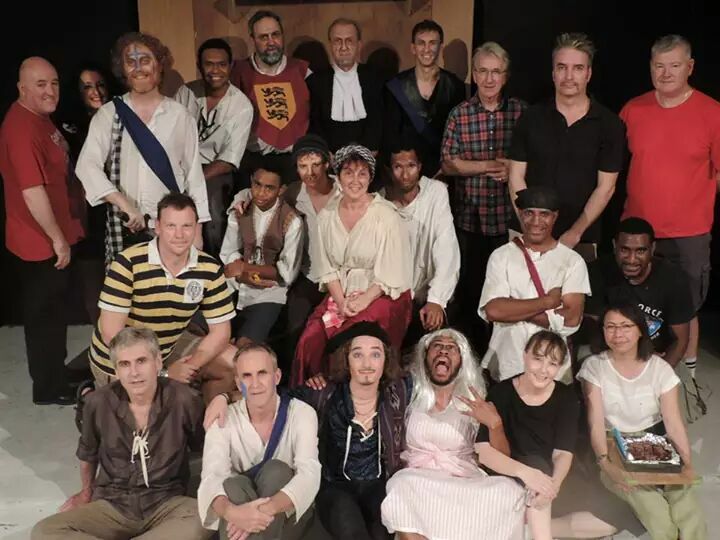 The production of Henry IV, Part I, brought together dozens of actors and crew for weeks of rehearsals and then 8 shows for the public. 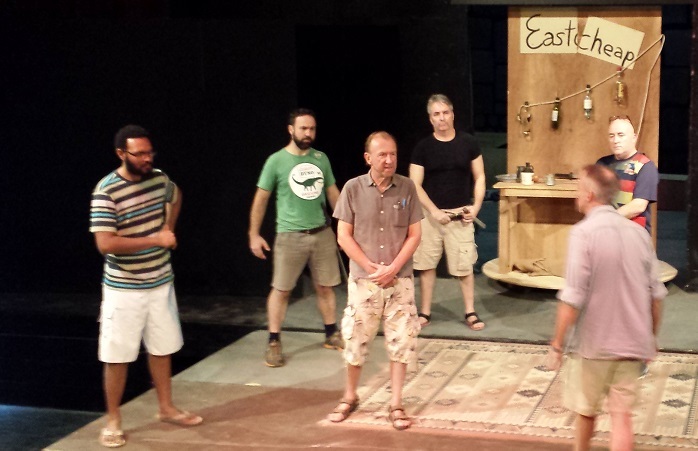 We began rehearsals weeks ago. Learning Shakespeare by heart is no small challenge. I had hundreds of lines as my character, Hotspur is one of the four lead roles, and the overly-enthusiastic and impatient leader of a group of rebels trying to overthrow the king. I studied this play in school, but I never really appreciated what a genius Shakespeare was until I got involved in putting on his work. His characters have real depth and are not simply two-dimensional black and white good guys or bad guys. 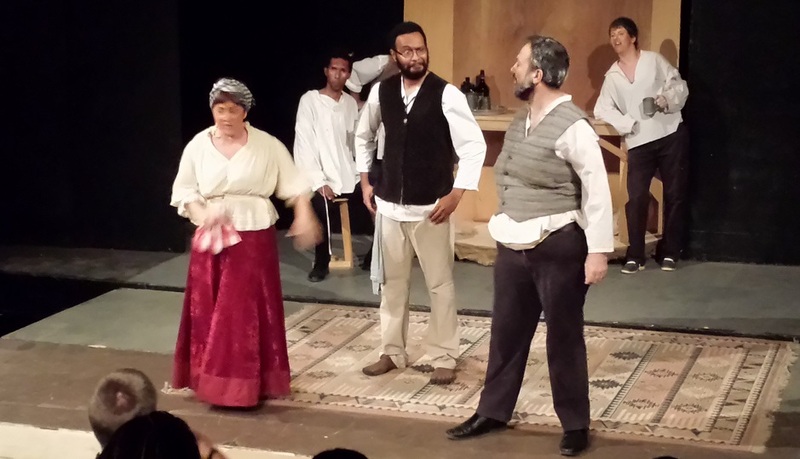 The play is based on English history. My character, Hotspur, did exist and indeed the football team Tottenham Hotspur is named after him. Hotspur is a mischievous rebel, but he is also a fun character who has both qualities and character flaws – chiefly a blinding bloodlust that fails to see reality when the heat of battle looms. 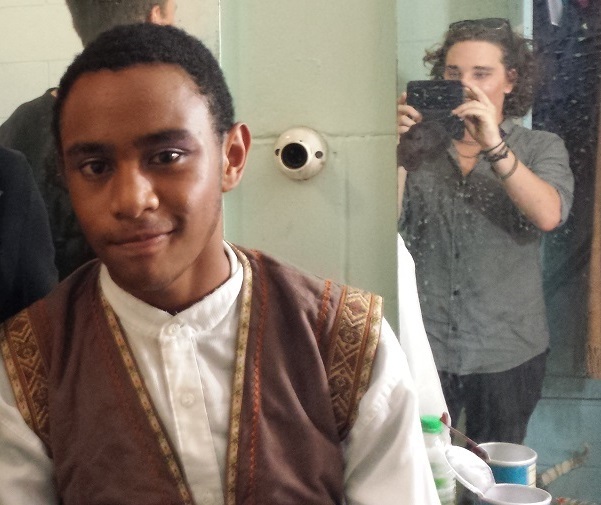 PNG film and television actor Tidman played the King’s son, Prince Hal. It was a pleasure to work with such a talented actor. 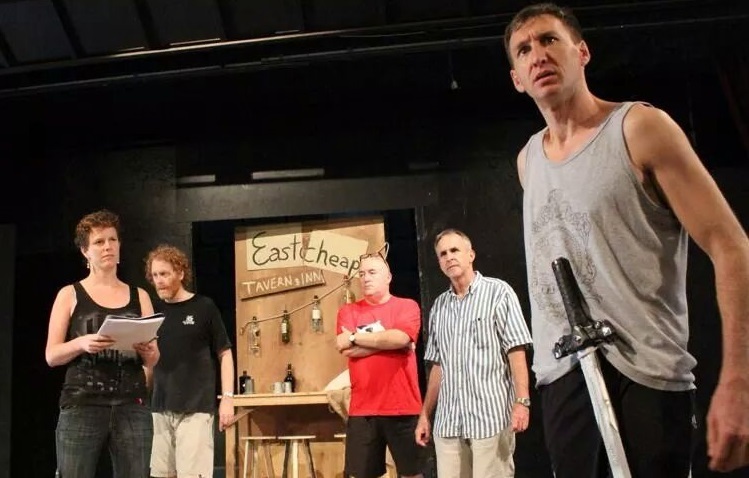 Simon Kaldy had the most lines, playing the affable Falstaff, Prince Hal’s friend and bad influence. Falstaff did not appear in the histories but was rather a fictitious character invented by Shakespeare to lighten the feel of the play. Simon did such a good job. I would have liked to have had more scenes with him. In a quirk of casting, we ended up with a female actor pulling out late for the role of Mortimer’s wife. 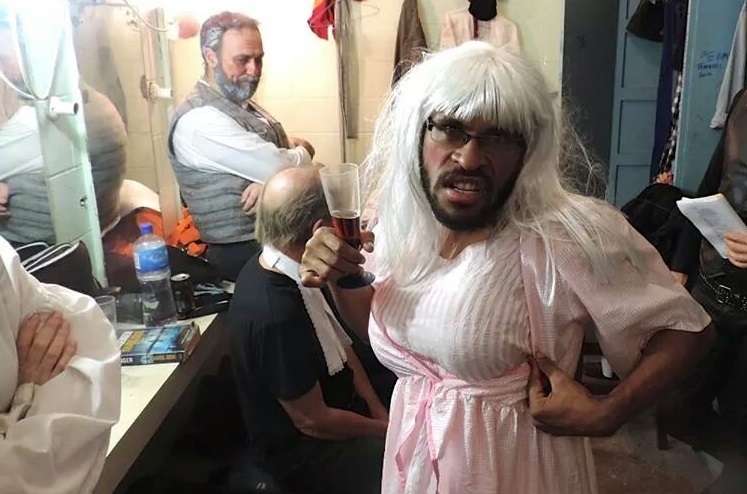 Her replacement with a bearded man in a dress brought the most laughs of any of the gags in the show. Finally, the rehearsals wrapped up and it was time to put on the show. Behind the scenes, a team of make-up artists strived to get everyone made up in time to go on stage. 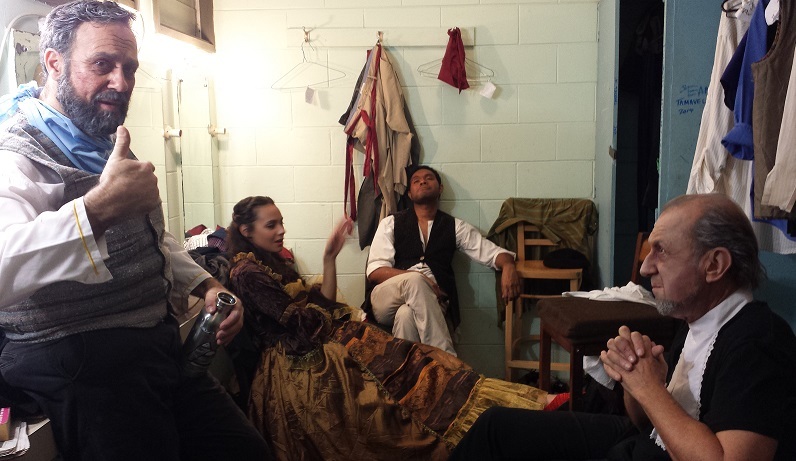 There is always a nervous energy back stage before the first show. 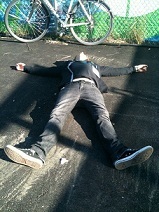 But once things get going, everyone relaxes. 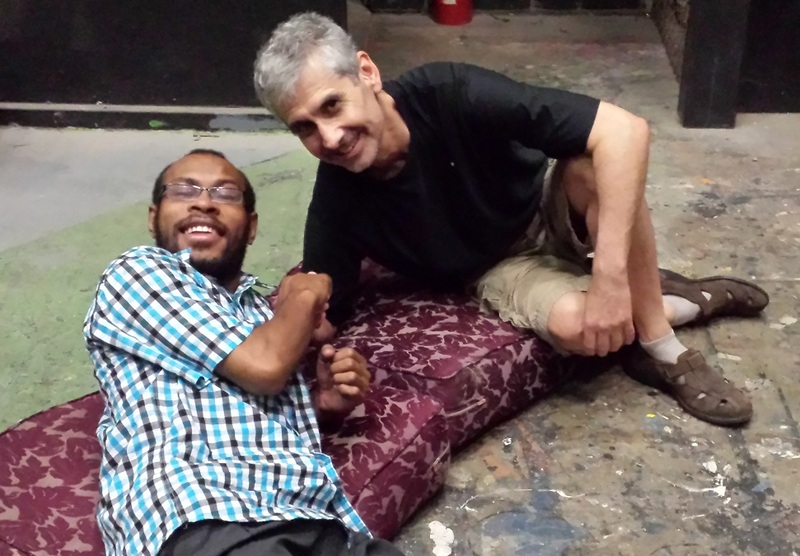 The cast and crew are a wonderful bunch and friendships are always strengthened in the backstage banter. Young Andrew, played the role of messenger – bring Hotspur unwelcome messages periodically throughout the play as he learned that his allies one by one fell away in the lead up to the rebellion. Some of the longest scenes take place in a bar in Eastcheap, where Hal lowers himself by associating with commoners. Think “The Lion King” and Hal is Simba, while Falstaff is “Pumbaa”. 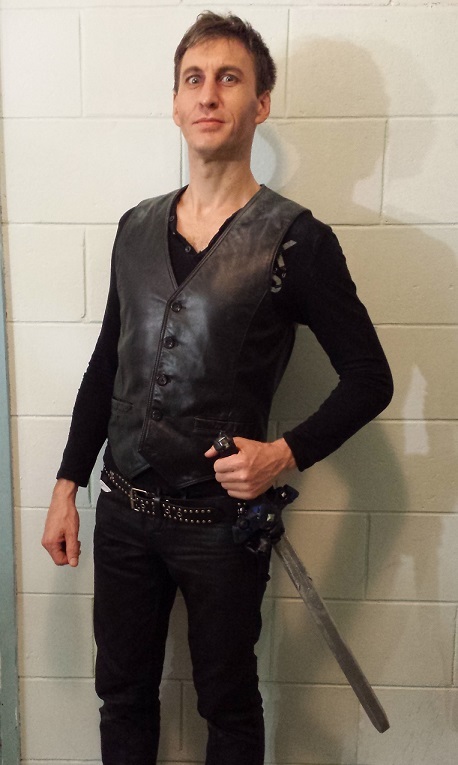 All dressed up, complete with sword on my belt, it’s time for Hotspur to make his entrance. Hotspur’s monologue “My liege I did deny no prisoners” is brilliantly written by the bard and a lot of fun to deliver as an actor. Hotspur’s intolerance and willingness to offend his allies, is counterproductive to his objectives. But we also see a softer side of him, in his scenes with Lady Percy. Just before the final battle, Mortimer enjoys a touching moment with his bearded wife. Eventually, Hotspur’s impatience and arrogance catch up with him. The rebellion is crushed and Hotspur is killed by Hal, after a very unsporting knee to the groin. 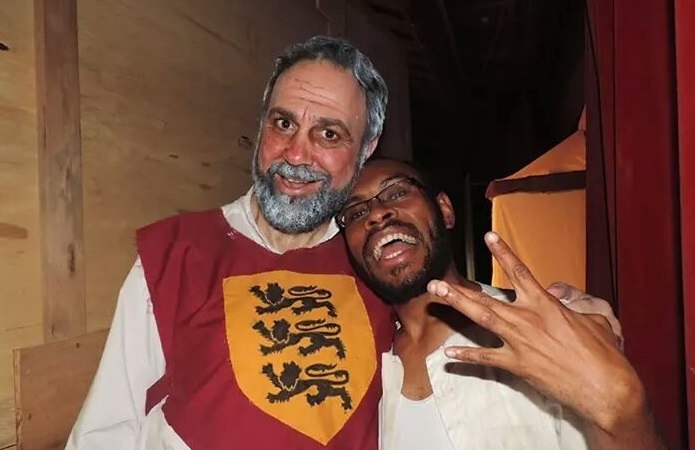 I’ve only done 3 or 4 plays in my life and this was the first time I got to die on stage. It was fun. Hal got to be the victor and Falstaff escaped the battle unscathed, declaring “The better part of valour is discretion”. 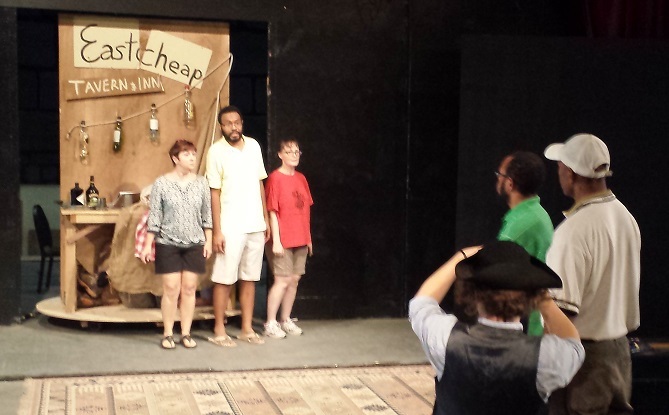 Our production received some coverage in the press. 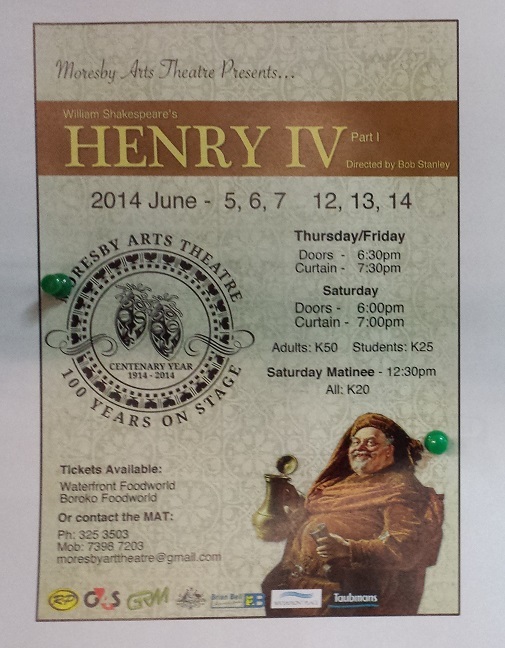 I was described as “The fearsome Hotspur”. Our eighth and final show was the best, and afterwards we had a cast party. Bob, the director gave each member of the cast and crew a personalised cast photo with a quote from them. Each actor was expected to read their quote in dramatic fashion. At the end, Simon presented the Director, Bob Stanley, with a cast photo and promo poster signed by the cast and crew. Bob was a tough director – striving for perfection and rarely offering praise. 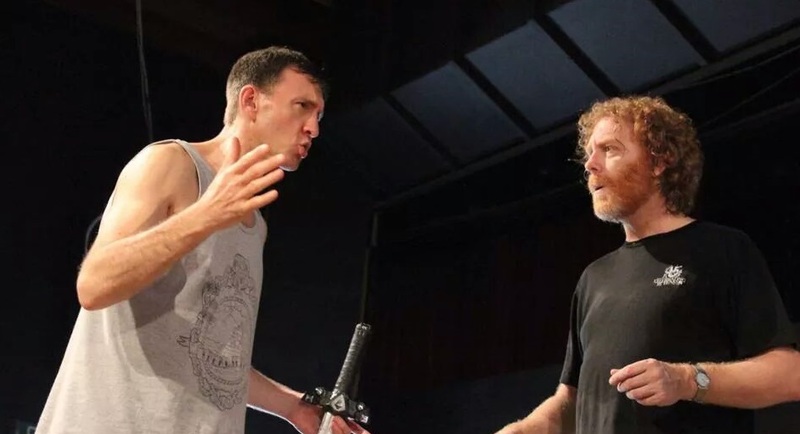 So when Bob gave me my poster, and he said, “I must have done something right in a previous life to have Chris play Hotspur in my play”, that really meant a lot to me. 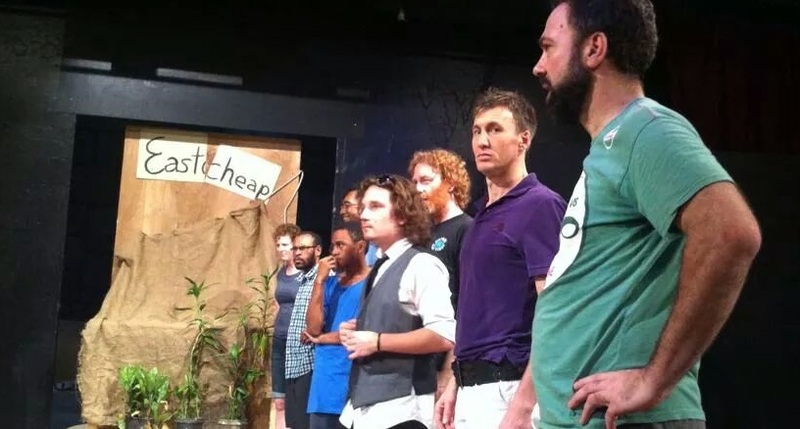 Putting on a play requires a tremendous investment of time and energy – the coming together of a team of talented people to work towards a common goal. 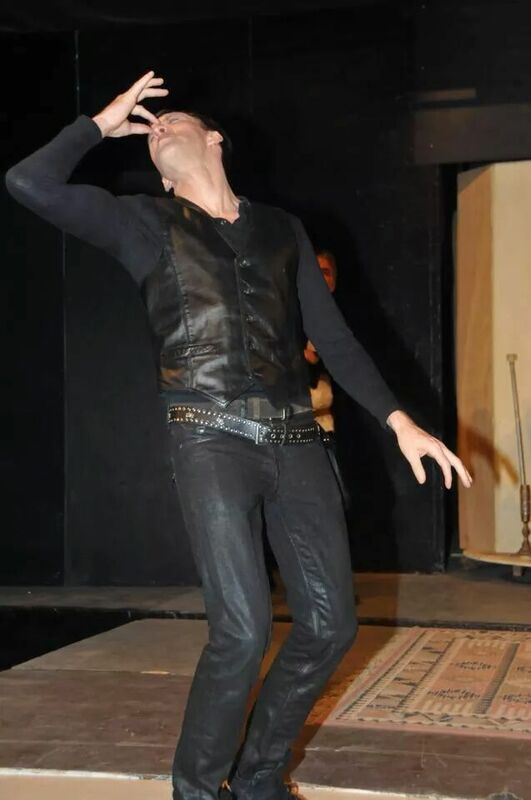 It is hard work, but it is so worthwhile when one stands before an appreciative audience and takes one’s bow. Congrats on your acting and new found fame.